Sorry, tourists! 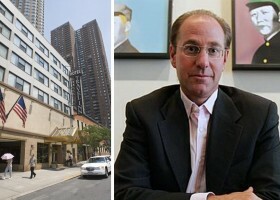 Hotelier Richard Born is rolling out the welcome mat for permanent guests with his latest project in Hell’s Kitchen. Born’s BD Hotels, best known for developing trendy spots like the Mercer and Stanhope Hotels, filed plans to build a 39-story, mixed-use building at 515 West 42nd Street, according to plans filed with the city’s Department of Buildings. The new building will be home to 350 apartments, filings show. Located one block west of BD Hotel’s forthcoming micro-unit Pod Times Square hotel, the site is currently home to a seven-story Travel Inn Hotel. According to the DOB, the planned building will have more than 277,000 square feet of residential space, plus another 4,300 square feet of ground-floor retail. Amenities will include an outdoor garden, fitness room and game room, according to filings, as well as a common terrace and sky lounge on the 38th floor. There will be 10 apartments on each of the third through 37th floors. According to filings, 10 apartments will have private terraces. Handel Architects is the architect of record for the project. The property has been in Born’s family for more than three decades. Born’s father, Robert Born, himself a developer, bought the property for an undisclosed price in 1981, according to property records. It’s unclear if the units at 515 West 42nd will be condos or rentals, and Richard Born did not immediately respond to a request for comment. Earlier this year, BD Hotels said it would lease furnished apartments at its forthcoming Pod Times Square hotel at 400 West 42nd Street. The 665-room hotel, where hotel rooms go for $180 a night, will have Pod Pads on the 23rd through 27th floors. Born and business partner Ira Drukier have developed residential properties before, including 173 and 176 Perry Street with architect Richard Meier. They also converted a Cass Gilbert office building at 90 West Street into a 410-unit rental with the Kibel family in 2008. BD Hotels is not shifting away from its bread-and-butter hotel business, however. In July, BD Hotels bought a stake in the landmarked Hotel Chelsea at 222 West 23rd Street, which they plan to renovate and reopen with 120-plus hotel rooms by 2018. Renovations involve working with the hotel’s 51 tenants to renovate and/or preserve their apartments.